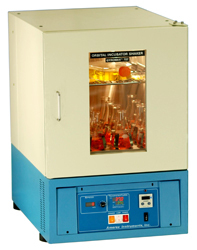 GYROMAX™ 727 and 727R orbital incubator shakers are benchtop/under bench models with the added benefit of an adjustable shelf for simultaneous incubation with or without shaking. The control panel is conveniently located near the top of the shaker to eliminate the need of a stand. The 1.25" of insulation, double-walled construction, and a triple-pane glass window minimize heat loss. This design, together with an efficient circulation system, ensures unrivaled optimum temperature uniformity throughout the chamber. The temperature is microprocessor controlled and is monitored accurately by a Pt-100 RTD. It is digitally and reproducibly set from a membrane keypad and displayed by an LED to within 0.1°C . The working temperature is 7°C above ambient to 80°C for the 727 and 4°C to 80°C for the 727R. To protect samples, an independent over-temperature thermostat prevents the chamber from accidental overheating; and in the 727R, another thermostat prevents overcooling. The timer is programmable for up to 99 hours or for continuous operation. A large, quiet fan ensures air and temperature uniformity throughout the stainless steel chamber. A brushless, maintenance-free drive motor generates speeds from 20 to 400 RPM which is digitally displayed. At the same RPM, the standard shaking orbit of 25 mm provides a higher oxygen transfer rate (OTR) compared to shakers with a 19 mm orbit because OTR is directly proportional to orbit size. A triple-eccentric drive with counter-balancing weights provides smooth and quiet shaking of heavy loads without the need for adjustments. The motor incorporates a built-in fan that lowers its operating temperature, thereby prolonging its life. The shaking stops when the door is opened. The chamber lamp is turned on and off with a switch on the control panel. The 15.0” x 15.0” platform can accommodate Erlenmeyer flasks up to 4 liters.